If you are looking to doll up these summers, then I have two words for you Designer Watches.Yeah Yeah everyone knows about accessorizing and and blah blah, but you see I hate accessories.I try and keep them to a minimum lest I end up like a Christmas tree.But the best thing about a watch is that you can never go wrong with it.And all you need is one watch to jazz up your outfit, and that's where designer watches come in. But designer watches don’t come cheap and that’s where Breda Watches steps in. I stumbled across this amazing website hunting for cheap Designer Watches and boy am I glad I did since I stepped on to the mother lode of designer watches.Beautiful, classy and elegant watches, all under $60(roughly Rs 3000). Breda watches was founded in 2009 with a desire to turn functionality into fashion. In the age of cell phone and portable devices used for time telling, Breda was introduced as a brand that could make wearing watches fun again without breaking the bank! Inspired by All-American fashion, the Breda design team created a new men’s and women’s watch line infused with runway flare, vibrant colours, and urban sophistication. 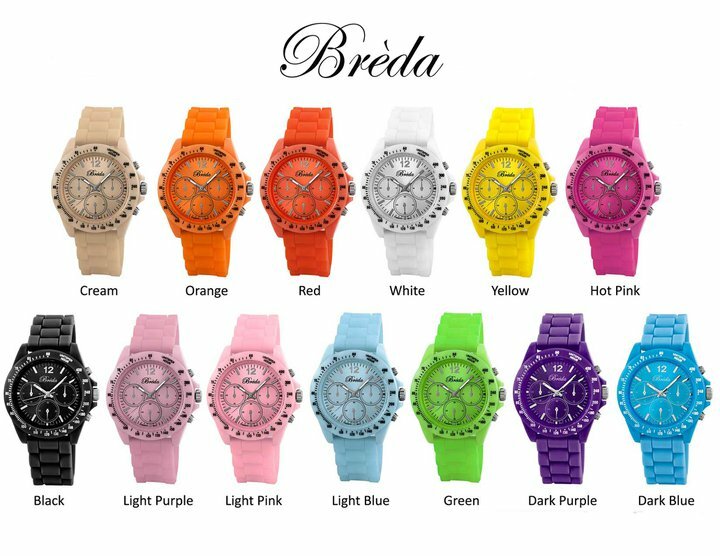 Breda is recognized as an affordable fashion watch brand that offers one-of-a-kind timepieces for women and men. Our timepieces cater to all types of lifestyles, from vintage classic to ultra trendy - Breda has a timepiece for you. In today's fast paced world, trends change daily and fashion moves like the speed of light. The Breda team is obsessed with fashion and luxury-style. They work diligently to create fun and trendy watches our customers love to wear time and time again. This would go with Indian as well as Western outfit.Love the bold gold strap and the crystal numerals. Pink makes me go weak in the knees, add Swarovski crystals and a mother of pearl dial and you’ve got a giddy me.I have this watch and I love it to bits.Will post a detailed review on it soon. Silicone/Jelly watches are all the rage these days and yeah they do come in a variety of pop colours but this black sporty Jelly watch with colourful numerals is the perfect accessory for casual dressing. So now you agree how cool these watches are right.And right now I want you to leave whatever you are doing and head to Breda pronto and get some watch love. You can avail the coupon code BEAUTYBLOG for a 30% discount on the Breda Website.Hurry the code expires on June 15th 2011. Love the audrey too.And the bling on Victoria gives it a really classy look.It does not look gaudy at all.